Building on Your Lot? As a lot owner there’s a slew of info you should know. Finally you have your own lot. 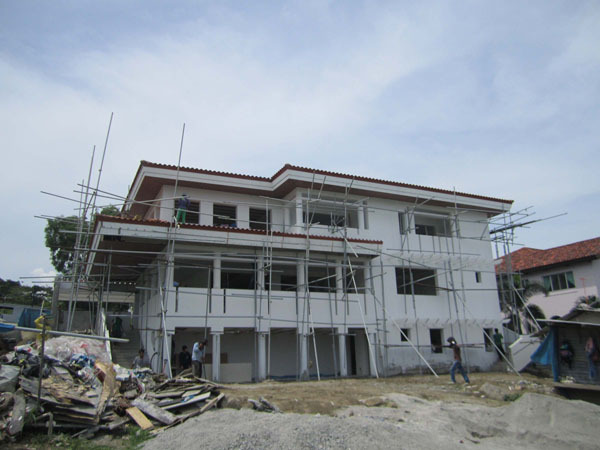 Perhaps you’re a first time lot owner in your dream exclusive subdivision, or an up and coming project manager with your first assignment for the corporate headquarters in the city, or you’re the businessman with plans for your factory in a vacant industrial lot. What do you do and how do you start? The following are some items and information you will need to see the viability and suitability of your idea to the location you have. Trusting that you have a verified Title of the property it will be necessary to confirm that the physical lot you call your own is the actual lot that your title describes. This item is usually required by the associations & building officials. It’s done by a licensed surveyor employed to verify the lot monuments as described by the title, and to put them in if there are none found. 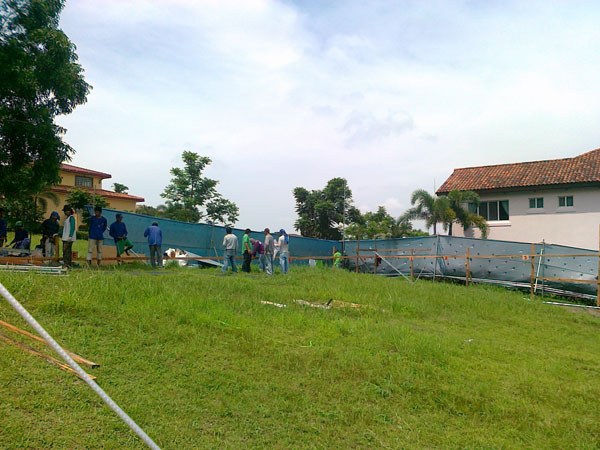 Knowing that your lot is really your lot, your architect and consultants can then confidently proceed to plan. Allowed uses-just because you own the lot doesn’t necessarily mean you can do anything with it, there are uses that have been recommended so that schools don’t find themselves between factories or industrial facilities. Classifications are usually: residential, commercial, industrial, institutional etc. For better or worse, whether strictly adhered to or not, it’s important to know your lot’s classification. Setbacks-these are the required clear distances that are free of any construction measured from the edge of your property line, commercial have longer setbacks from residential, encroachments are permissible given certain conditions. Building Heights-certain land classifications, like residential, allow buildings up to only 3 storey or 9 meters. Commercial allow for higher, but for certain locations that are near airports, you will need to also get clearance from your local aviation authority. Parking requirements-for a house this is not always a problem, but if you are building a large multi-residential building or an office and other large buildings, you will be required to provide a certain number of parking slots against the size of your building. This is usually expressed in a parking ratio for example 1:100sqm means you need to provide 1 car slot for every 100 square meters. Sometimes if you cannot provide the parking required it can affect the size of building you are planning. 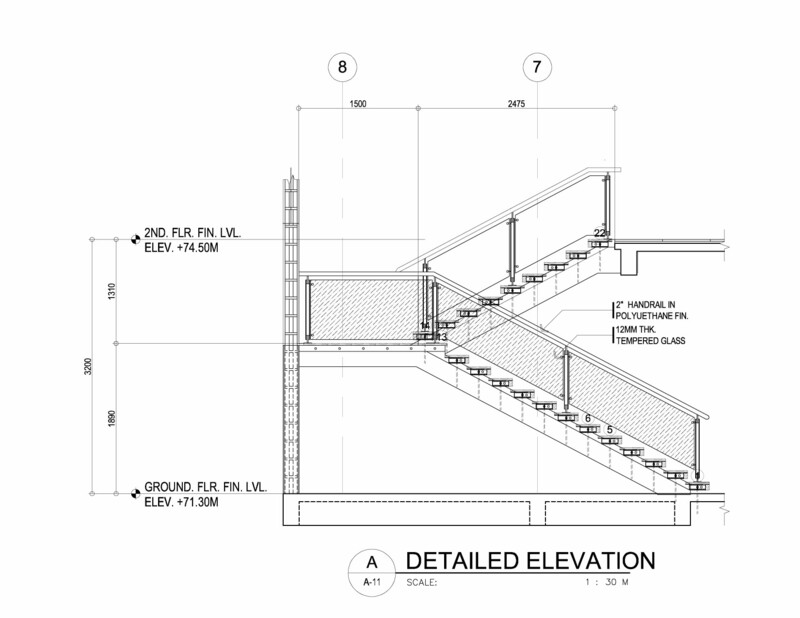 Basement requirements-some cities allow basements to approach the property line, in others they follow the setbacks on the ground floor. A basement is of particular interest because of the parking slots you will accommodate, as well as in terms of what equipment you can place there without sacrificing any of your ground floor space, specially in large buildings. For residences, basements may be an option in lots that have a lower elevation. 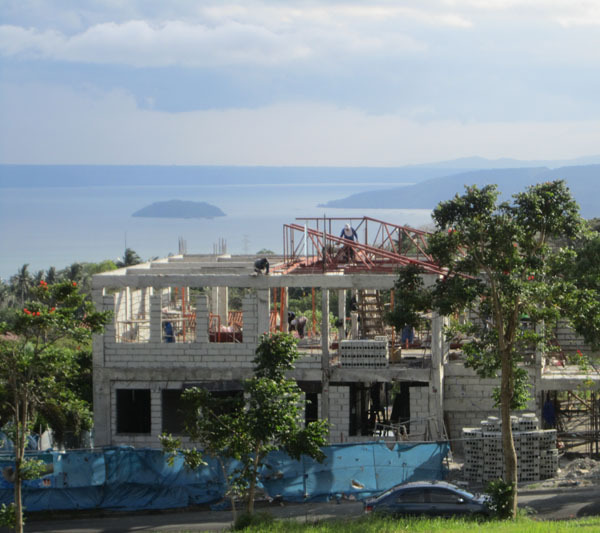 Setbacks- the setbacks of the developer are usually greater than the zoning ordinances from my experience, but between the two whichever is most restrictive is what will govern. 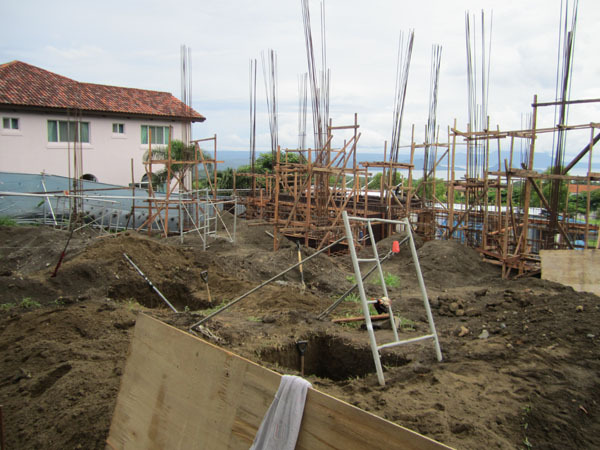 Be wary of the setbacks for corner lots, as well as rules for swimming pools, canopies, balconies etc. as these may have rules indicated in the setbacks. Buildable area- the area you can build is also contained in the zoning and land use classification, but as again it may be more restrictive in some places. 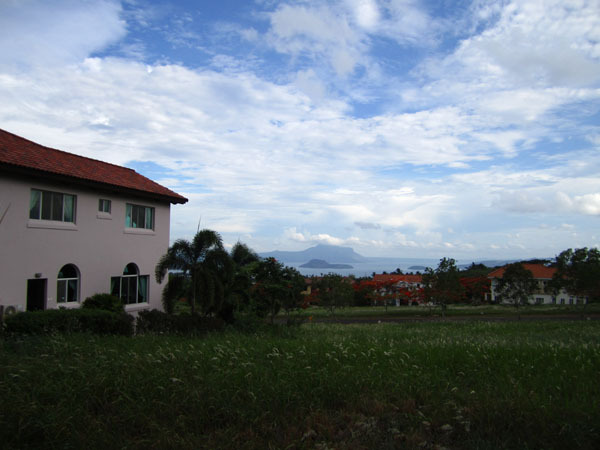 For example a resort type subdivision I have encountered required only 30% of the lot to be buildable area, the intent was to protect the leisure type development from being overly built up and to create more greens and landscaping. Open space-as well as limits on the buildable area, you may have also limits on the type of open space you have, some may only have a certain required area for “hardscape areas” like walkways, driveways & foot paths. I’m aware that this also helps in creating catchment for rain water run off, so that there is enough ground space for water to seep back in to the soil. 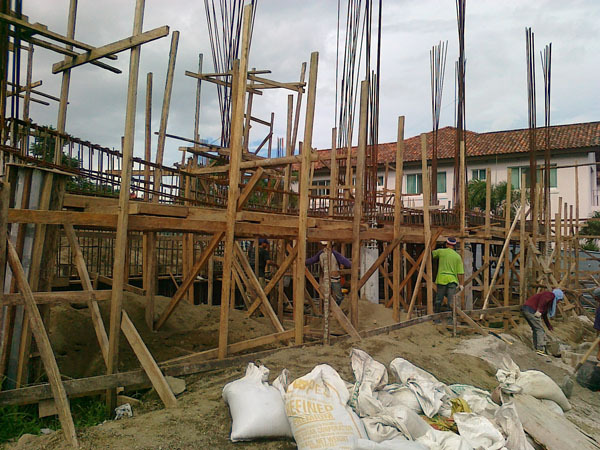 Building Height-though the height is mentioned in the zoning and classification, the deed of restriction may have the same limits like 9.00 meters, but will give a definition where the limit is measured from. One particular restriction was to measure from the highest corner monument of the lot. If the highest corner monument does not coincide with the highest point on your lot it may mean more cost in terms of excavation and shoring to retain the soil, or hauling for the removal. Utility requirements- in some places you are required to have you own utilities on site, some municipalities without the facility to recycle and reuse water may require you to have your own sewer treatment plant as in large developments. For residential areas, sometimes they also require a certain type of generator for your use, for example 70 decibel rated generators so that they do not cause noise pollution and disturbance. Recommended Architectural Style-this is a particular problem for a client who has a certain expectation as to the look of the building, but was not informed about the restriction of the lot prior to purchase. Some styles that I have encountered are: California Missionary, Modern and other that are ambiguous like Asian Modern, Asian Tropical. It would be best to have your designer coordinate with the approving authority so that the intent of the developers can be taken into your consideration and proper planning can accommodate the requirement for approval. 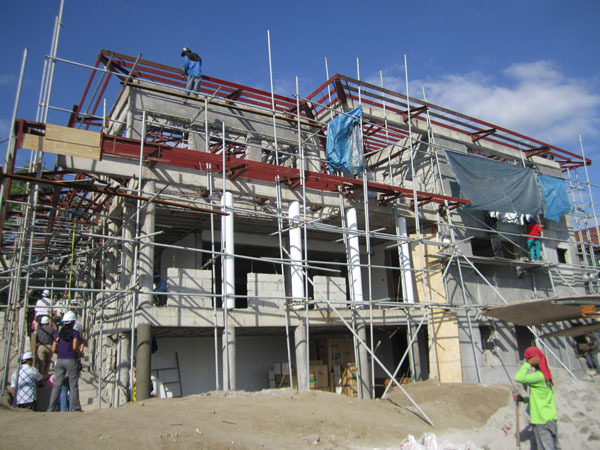 All in all these items are important to be revisited because these shall be what the approving authorities will check on for the approval of your building permit. 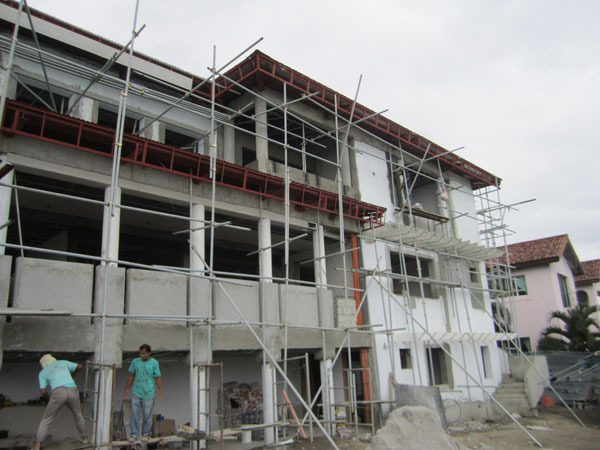 The building officials will always refer to the building code, local ordinances, zoning and land use classifications in use, and the developer or owner’s association shall review compliance to the deed of restrictions before endorsement. Not to mention it will also be the items that will define the work of your architect and consultants, any change or variation shall greatly impact the outcome of the project. 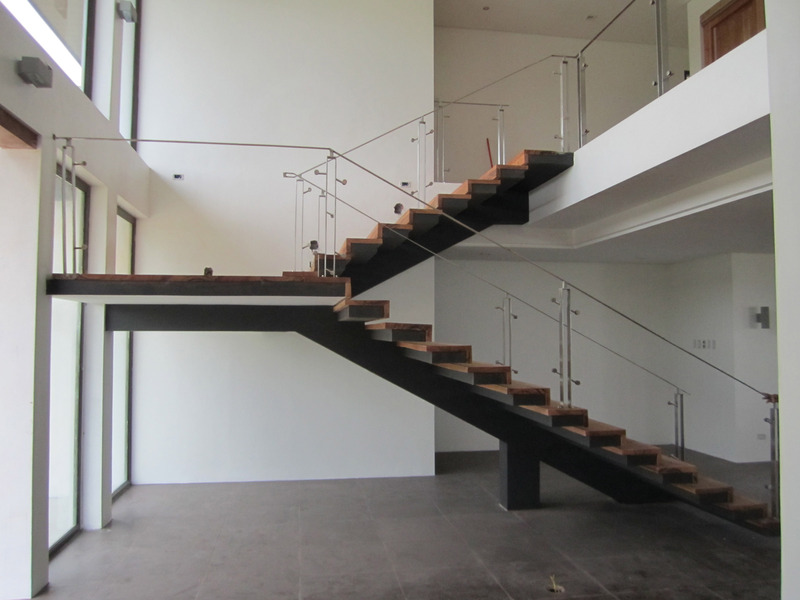 A Modern Cantilever Staircase in Steel and Wood. 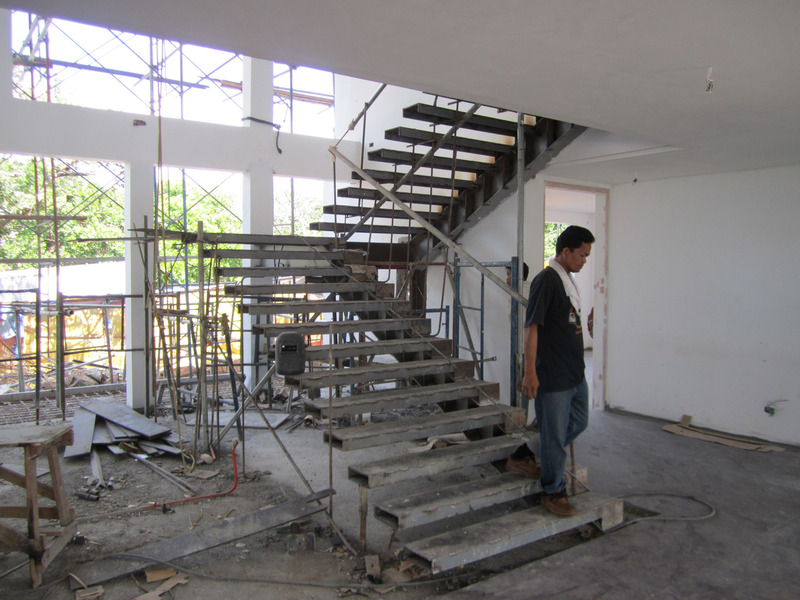 The clients wanted a nice stair case, the lady of the house went back to the memory of an impressive concept her father used to build, as a contractor in Pampanga. 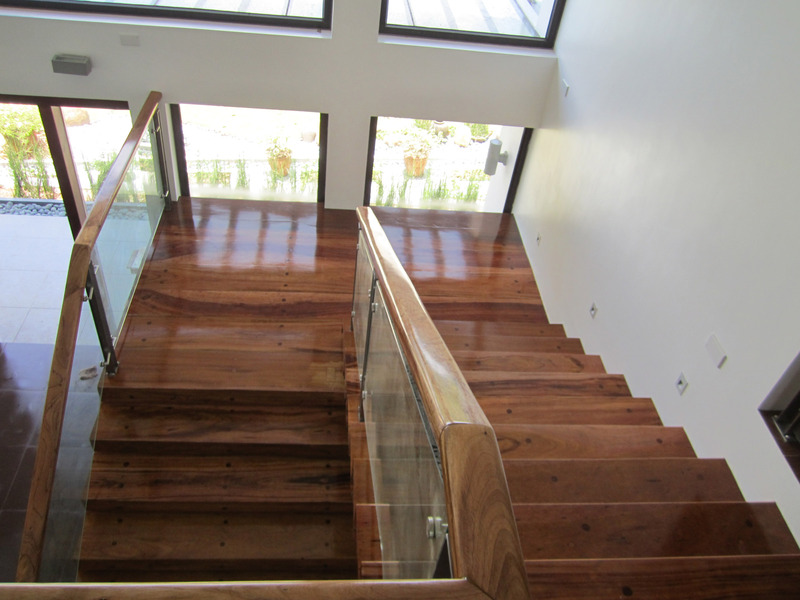 It involved cantilevered stair treads made from then plentiful hardwood, which was poured in place together with the adjacent wall. This time instead of 1 meter wide stairs, they wanted 2 people to be able to go up and down, while being strong and safe. 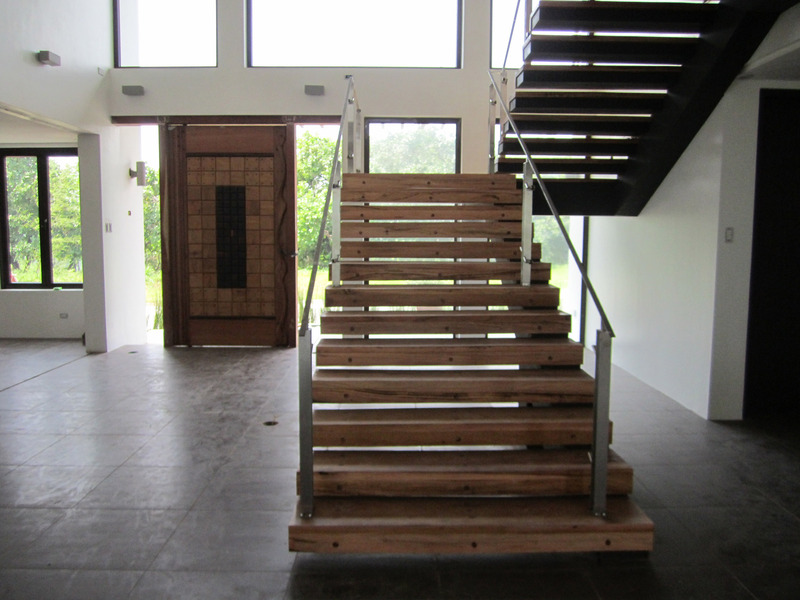 Automatically I thought of making it in steel and cladding it simply, hiding the structural acrobatics within (and any imperfection along with it), and as a nod to the original concept of wood planks, we would top the treads with recycled wood. 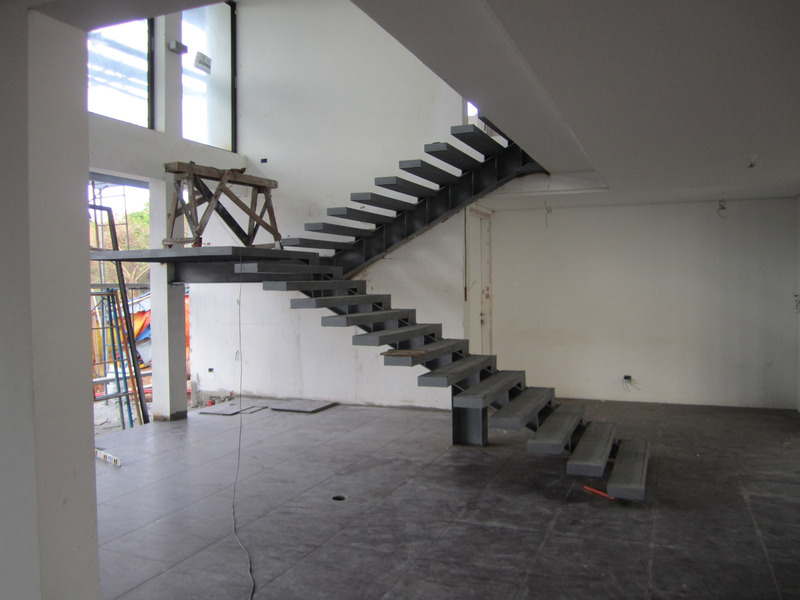 Our engineer used steel flanges, steel plates with stiffeners to come up with a tread and stringer that we hoped would be stable, and we incorporated a simple railing with tempered glass panels for safety and support while going up and down. 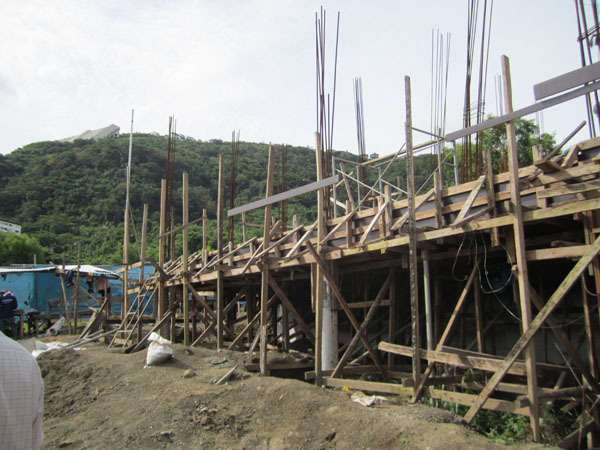 After getting approval for the details using a 3D perspective of Google Sketchup, we waited for the concrete structures to reach their maximum strength (on the 28th day) before getting down to the welding of the main stringer. We found that it would be better to support the first flight from the exterior wall instead of immediately upon the landing to make it more graceful. But, we found the treads unsteady as it vibrated while we went up and down, so additional vertical reinforcements were done to stiffen the main stringer and the tread was made into a box beam for further reinforcement. After completing the final run to the 2nd floor and all the structural details, it still vibrated a little as 2 people used it, though fortunately this would solve itself as we proceeded with construction. Primer was applied and preparation was made for the installation of wood planks. 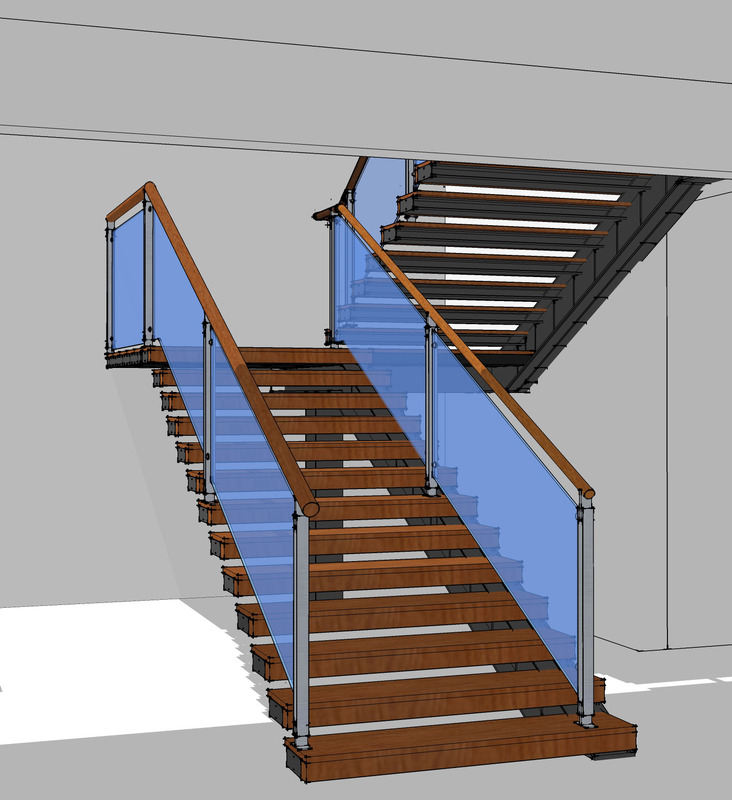 The main stringer and the treads were closed off to give a less “industrial” look and a simpler profile for the stair. To stiffen the main stringer more, a short column was placed a third of the way from the main stringer. 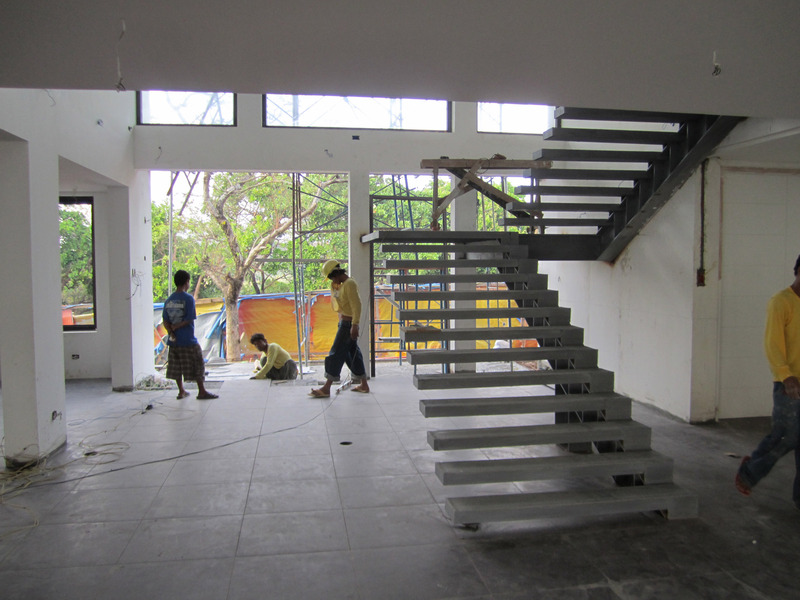 And to make the stair color float from the wall “gun metal grey” was chosen. Wood was requested to also clad the side of the tread (the riser side) so that as the user would see just wood going up. Tempered glass was chosen because its stronger than ordinary float glass, as well as it was safer, because it didn’t become shards when it shatters. 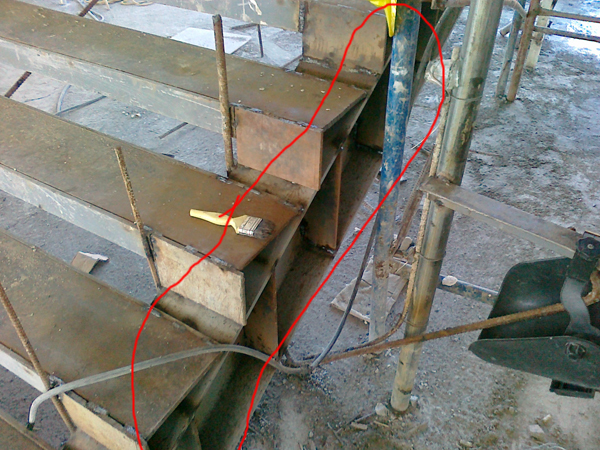 We also found that any vibration that was still evident during the fabrication and testing of the steel frame was removed by the installation of the wood plank, which now acted as a stiffener to the tread. The right side railing on the first flight was removed in favor of a more impressive look, so that the cantilevered treads of the second flight could be more readily seen, hand rails were also installed on the stainless steel railing frame. All the wood was then sanded and finished in semi-matte polyurethane finish. 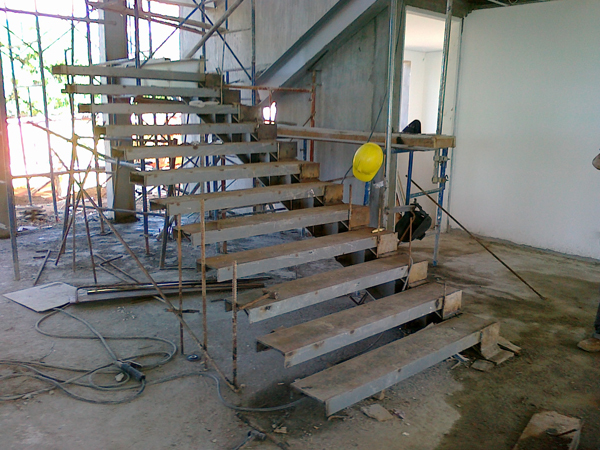 I have yet to get a dedicated picture of just the stairs, but here it is seen with the rest of the space. 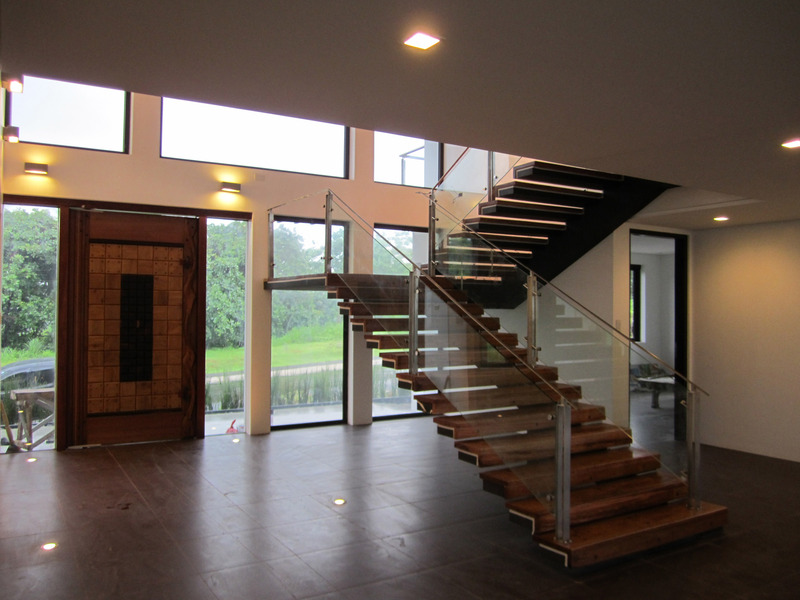 It was designed as ‘welcome’ element coming in from the main door, impressive as it is useful. We start with the open lot. The plans are done for this point, and everything that follows is unique for this one location. It is here that we break ground. After all the drawing of lines on paper, we draw the lines on the ground, the perimeter is fenced, and all the preparations are laid out for use. 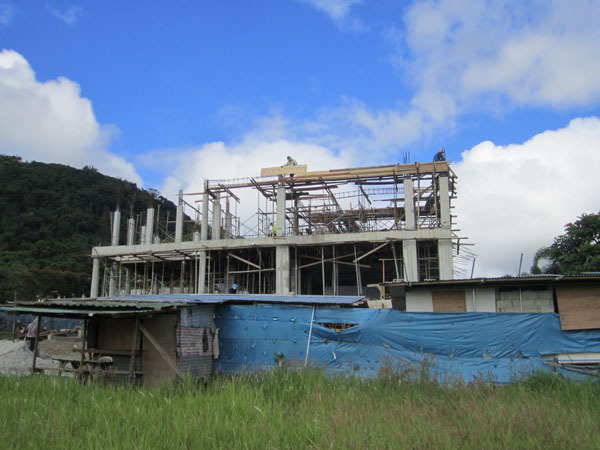 Incidentally by this time, the bulk of the Architect’s design work is actually done and the supervision work that follows is intended to keep the work faithful to the intent. The plans on paper, point the way for the grooves on the ground. The work proceeds! And it is messy, but organized, digging for the bedrock which is the real foundation of the house, we rest upon the earth and proceed in the opposite direction. Taking care as we have the bones of the structure come in, to have the smaller lines and pipes properly provisioned so that to be out of sight later on. 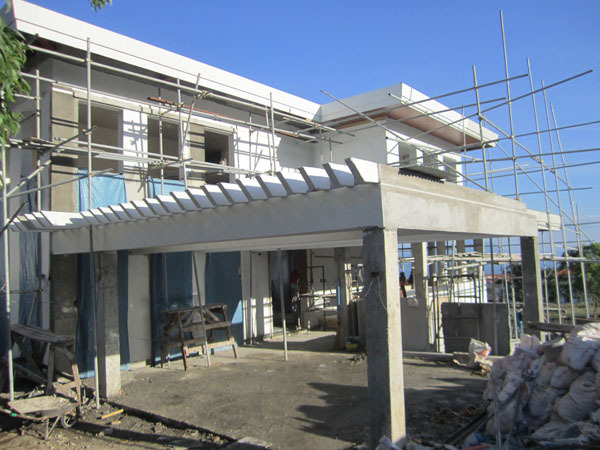 Its a race to the roof, as we hold the work apace with the good weather available. The short term goal is to reach the roof level, as this shall shelter all the work that follows. In the meantime the summer sun is blessing and bane, allowing the work to proceed, but making it hot for all involved. We’ve got it covered! 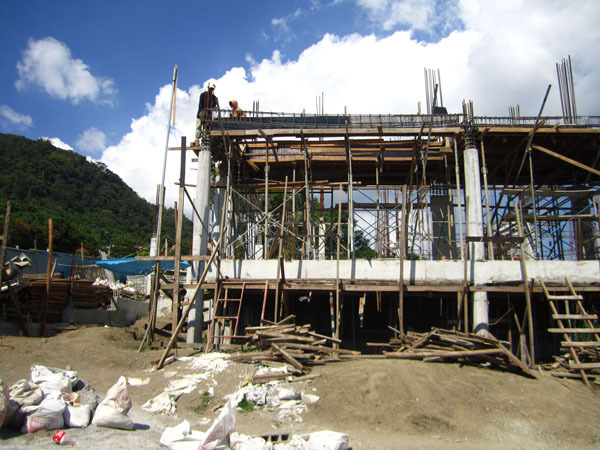 The roof makes our collection of columns and beams a true shelter, the main consideration and requirement. 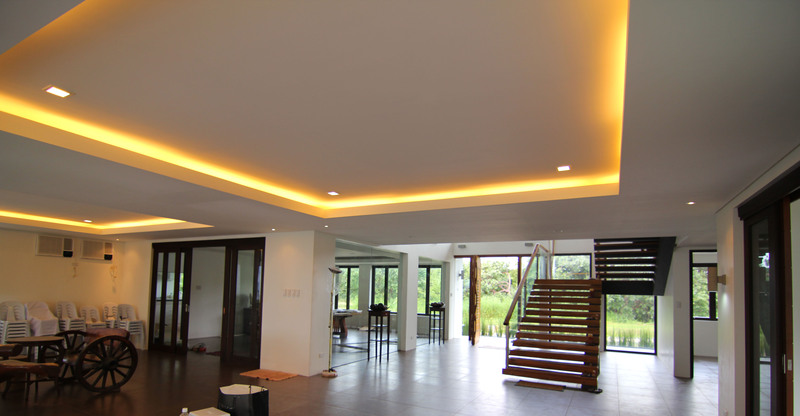 Now the numerous minute details that make a house a home come in. Atleast now the weather holds us less and we proceed with the knowledge that we are halfway there. 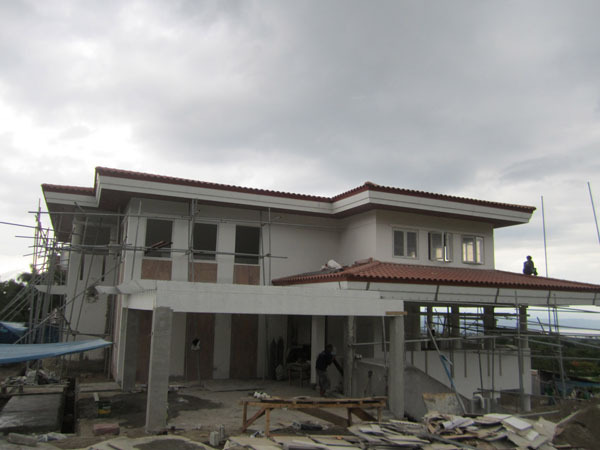 Appropriately when the plaster & paint make the project a “white house” we are into finishing. 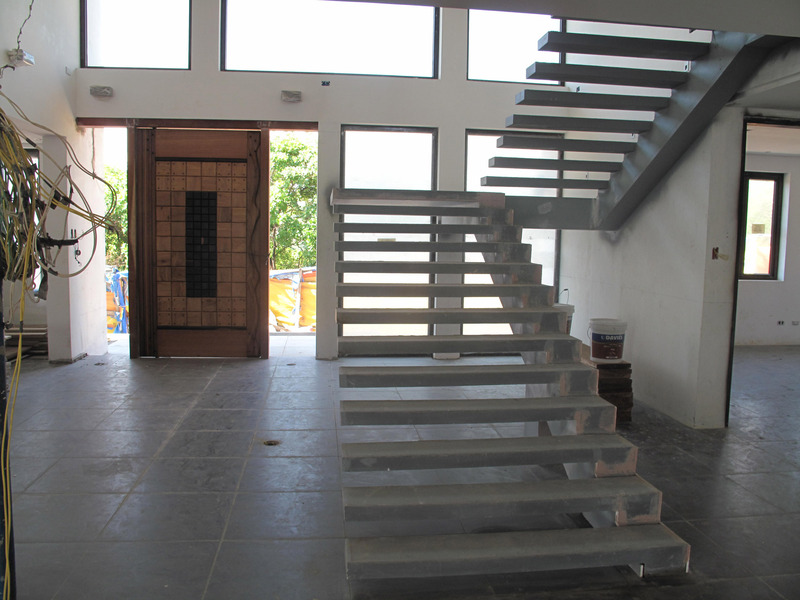 All the materials that will form the surfaces, walls and floors that we see everyday is approved and installed. The lines that will allow, water, waste, electricity & data to permeate the spaces should all be in place ready for the final fixtures chosen by the client. With the finish line and turn over in sight, everything is being readied. All the colors are chosen, all the lights sent for installation. Securing locks and windows are ongoing, and we prepare for the time when we exit the site and allow the house to fulfill its intent, to become a part of the place, to share the lot’s identity and to serve its users for as long as they intend it to. 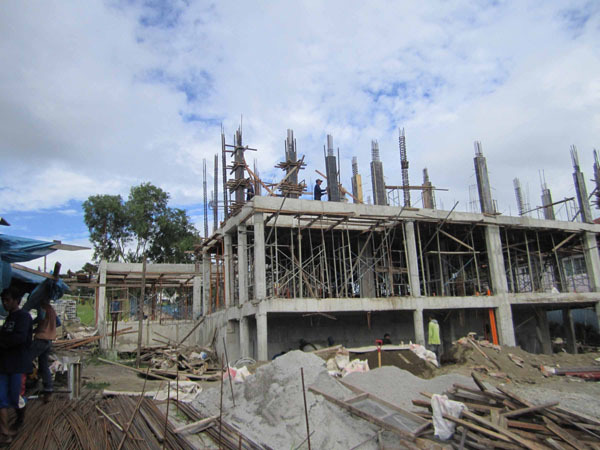 Note: The images above are part of the photodocumentation of all Eugene T. Mangubat & Associates projects. 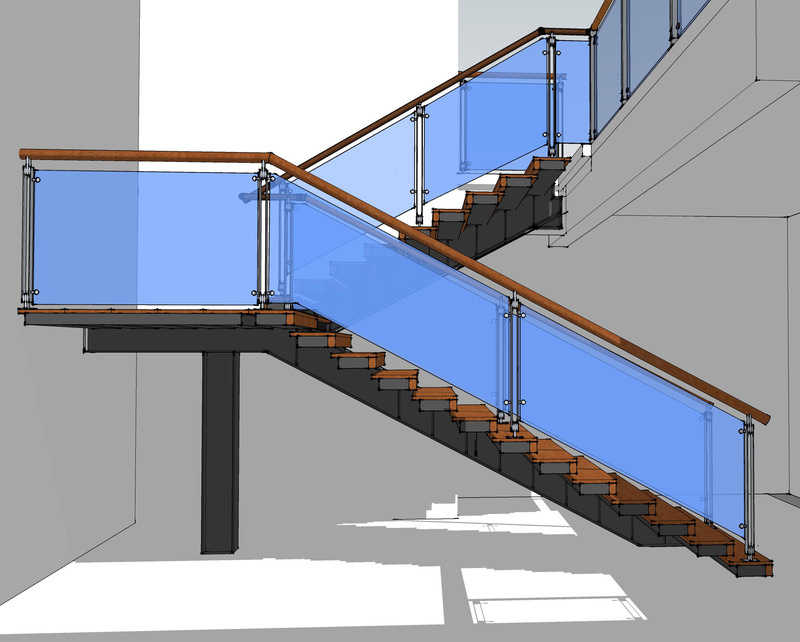 These form part of an “image report” that is weekly submitted electronically to the client during construction.